We live within a constant paradox. We spend hours in department stores, searching for the next and newest fashions. We feel like we need them—and yet we return to wearing the same timeless staples in the weeks that follow. We have closets full of trendy clothes that go out of style too quickly or never get worn in the first place, tags still dangling from their seams. It’s the “full closet and nothing to wear” problem—and advocates of capsule wardrobes are intent on solving it. With the rise of the minimalist movement in recent years, capsule wardrobes have run rampant across social media. Style gurus boast how they’re able to dress well with thirty, twenty, or even ten items in their wardrobe, and their OOTDs—outfits of the day—are plastered on every public outlet. While we’re never ones to steer you in the direction of every latest craze, it’s worth evaluating the merits of the capsule wardrobe system to see if it’s worth implementing these principles into your own wardrobe. A capsule wardrobe is an individualized and versatile set of wardrobe staples that mix and match with each other. It’s a simplified way of dressing and shopping that promises to leave the wearer feeling free from fashion stress. This is an easy-to-follow clothing system that many believe helps eliminate the problems they face when purchasing clothing and curating their own personal style. A capsule wardrobe isn’t a rigid, unyielding system of limited choices. You get to choose exactly how many pieces go into your ideal closet; you also choose how often you’ll switch items around based on the season or the occasion. Functional garments like underwear, workout clothing, and accessories aren’t counted as part of the set. The system isn’t meant to be conformist or stifling—rather, it’s an opportunity for creativity to flourish within predetermined boundaries. Why Create a Capsule Wardrobe? By purchasing a few well-chosen high-quality items, you prevent your closet from being stuffed with cheap—and cheaply made—alternatives. Why have ten mediocre blue shirts when one gorgeous and perfectly-fitting button-down will do? The capsule wardrobe system quells the urge to buy items at every sale you pass. When you purchase items thoughtfully and within a strategic set of parameters, buyers’ remorse is removed from the equation. It’s an immediate relief to your wallet—and to your sometimes-guilty conscience. Many gentlemen are reluctant to participate in the fast-fashion industry and all the waste that comes with it. Narrowing your closet down to a capsule wardrobe means far fewer items of clothing will be leaving your hands and going straight to an overcrowded landfill. Finally, many professionals choose to go the capsule route in an attempt to reduce daily decision fatigue. When all of your clothing items coordinate together, choosing your outfit in the morning becomes easy and instantaneous—plus, it’s a whole lot easier to organize your closet in the first place. Steve Jobs, Johnny Cash, and Mark Zuckerberg have all cashed in on this time-saving strategy. When you create your capsule wardrobe from thoughtfully-selected pieces of high-quality menswear, set yourself up for success from the start by formulating a plan. Shift your purchasing strategy from buying every new item that catches your eye to looking for specific pieces that will mesh with your system. How many items do you want to have in your capsule wardrobe? How often do you intend to rotate items in or out of your collection? Which color scheme will fit your style best? 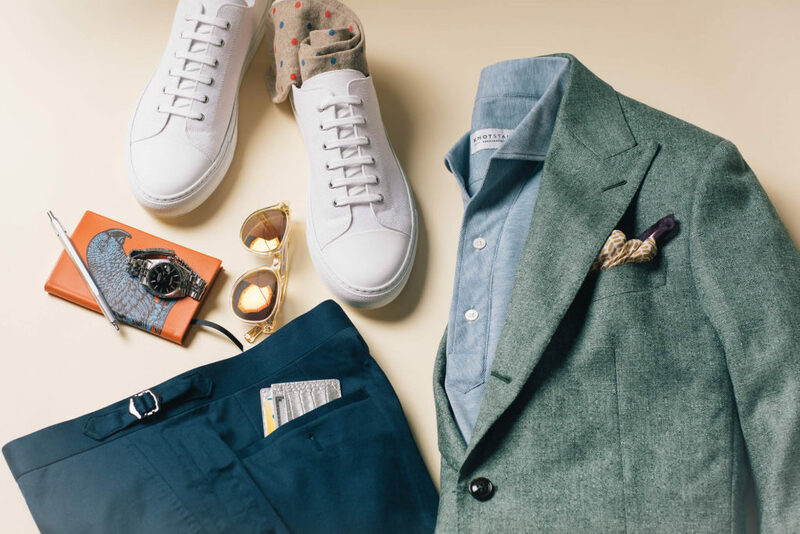 A suggested capsule wardrobe for men might include twenty key items, with certain pieces switching in or out as the seasons change—for instance, you may want to add a great pair of shorts in the summer, or a warm turtleneck sweater in the winter. 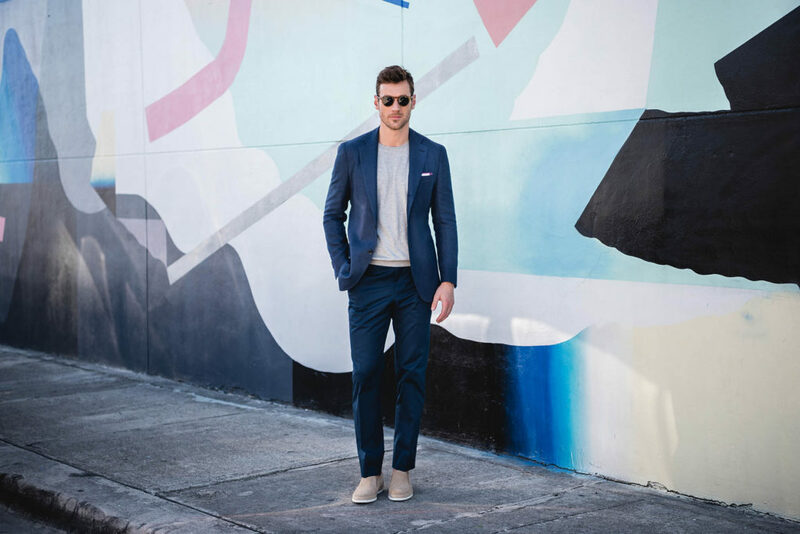 A color scheme built around versatile neutrals like navy and tan tends to work best. Every capsule wardrobe needs pops of color, so be sure to sprinkle garments in your favorite bold shade—deep red, bright blue, forest green, pale pink—throughout your collection. In the example below, our core neutrals are navy and tan, with a bold shade of red used strategically to add visual interest. 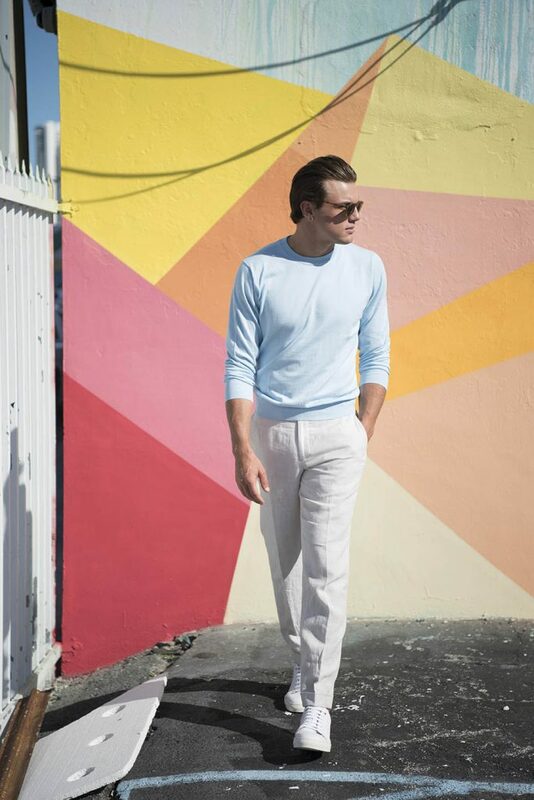 Try structuring your wardrobe like the following, supplementing these fourteen key pieces with a pair of dark wash jeans, a couple of high-quality t-shirts, and two or three pairs of nice shoes. If you’re unsure where to find unique, versatile, well-made clothing, custom menswear is a great place to start. When you purchase a pair of trousers made exclusively for you, you eliminate the “it doesn’t fit” problem most of us experience with off-the-rack goods. The high-quality fabrics used in premium custom clothing can stand up to frequent wear, while the careful construction ensures these items won’t fall apart after a handful of uses. Switching to the capsule wardrobe system means thinking of your clothing as an investment; to gain the most value from it, invest in custom clothing items you love and will wear on a regular basis. Get your feet wet with the capsule wardrobe system gradually. 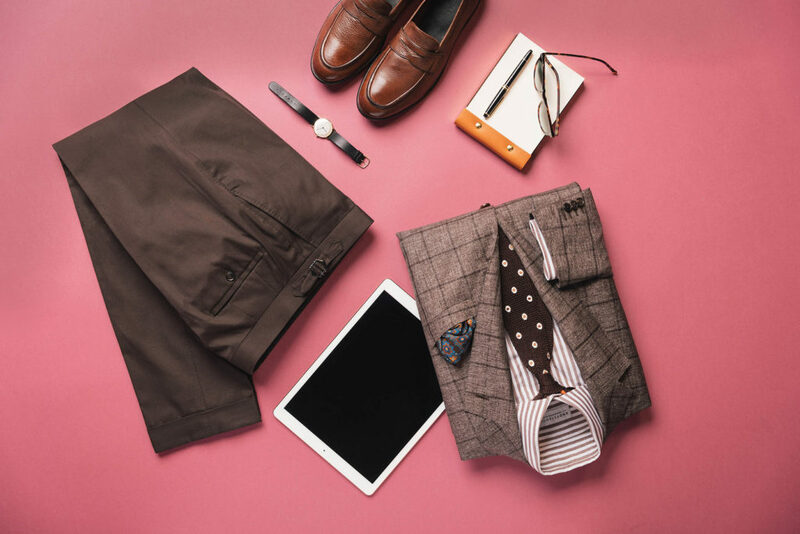 Identify your most-needed clothing staple—perhaps it’s a classic grey suit, or a perfect pair of chinos—and schedule an appointment with a personal stylist at your local Knot Standard showroom. We’ll work together to build the foundation for the interchangeable wardrobe that will suit all your style needs.